This image shows the bright nebula Messier 17, also known as the Swan Nebula or the Omega Nebula. This nebula is located about 6000 light years away in the constellation of Sagittarius. It was discovered by Swiss astronomer Philippe Loys de Chéseaux in 1745 and later catalogued by Charles Messier in 1764. The central part of the nebula is lit up by a cluster of extremely bright young O and B type stars. It is one of the brightest and most massive HII regions in our galaxy and appears very similar in spatial structure to the famous Orion Nebula, but the Swan is viewed more edge-on from our vantage point. The nebula is also very bright visually, actually much more so than its famous neighbour the Eagle Nebula - which traditionally is the more photographed of the two. 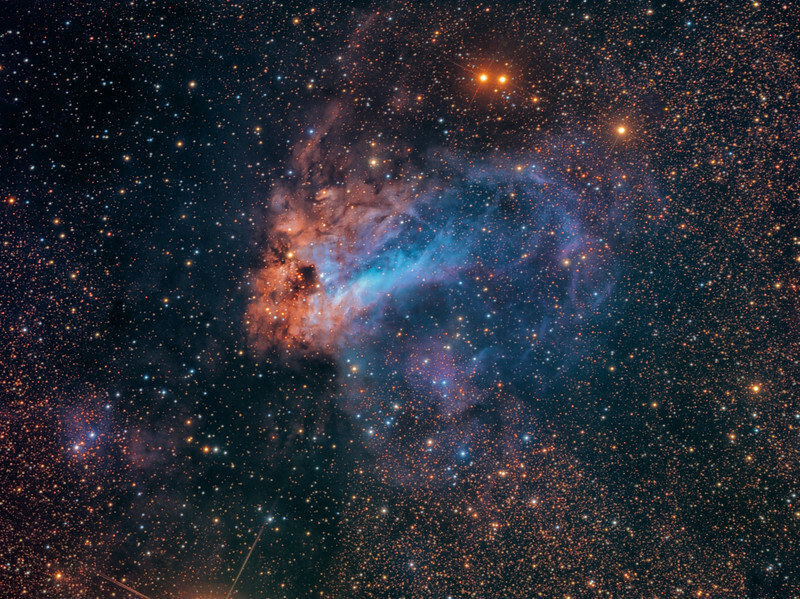 Traditional images of emission nebulae taken in visible light primarily display the striking magenta colour from glowing Hydrogen gas, as well as large dark obscuring clouds of dust. The infrared part of the spectrum penetrates these clouds better and reveals complex details and thousands of young stars that are otherwise completely invisible. These stars shine primarily in the infrared and appear as golden red in this image. Only a minority of these are visible in traditional optical images. To create this image I used a special infrared filter. Effectively the band observed is 700-1100nm since the silicon CCD chip is not responsive to wavelengths longer than that, and this band is called NIR (Near Infrared). One issue arising from this technique is that the NIR band does not have a colour as such, since it lies outside the visible light spectrum. To create a colour image from the NIR data I have developed a colour stacking technique which has produced promising results so far. I use the NIR filter together with G and B filters to create a colour composite. The resulting images are assigned to the different channels as NIR->Luminance, NIR->Red, G->Green and B->Blue. Substituting the R channel with NIR nicely brings out the contrast between the nebula itself and all the young obscured stars that shine primarily in infrared. This colour image is then overlaid with the NIR frame used as luminousity. The result is a predominantly blue nebula, but with the areas that are bright in NIR showing as distinctly golden red which highlights the features that are visible in the NIR band and at the same time produces a visually very pleasing image. This image is part of my series of optical/infrared comparisons of famous nebulae. Click here to see the exact same field of view as a traditional optical LRGB image. This too, fantastic my friend!